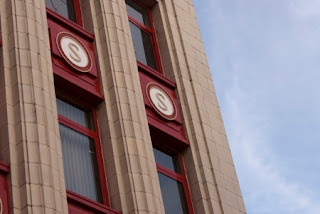 In advance of the tours starting this Saturday, our tour guide Frances gives us a taster of the fascinating PLACE Art Deco Belfast walking tour in Belfast in August 2011. Thanks to Arts Extra on BBC Radio Ulster for the interview, and thanks to our volunteer Roisin at PLACE for putting the video together. Sinclairs Dept Store, one of the buildings on this month's Art Deco tour. Photo by Daniel Donet.